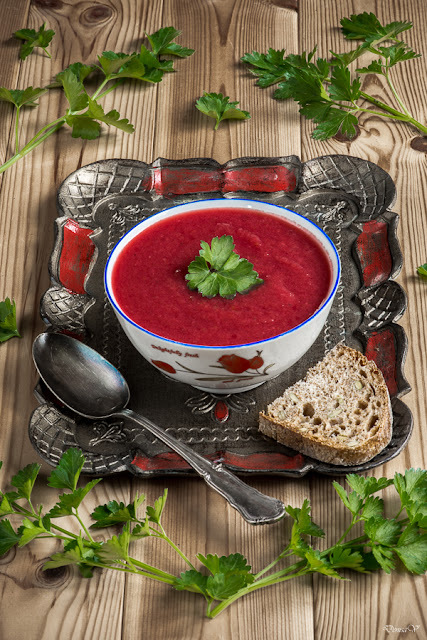 The soup that I made is a beet one, complemented with some other vegetables. I recognise that I took advantage of its colour to "sell" it to my daughter. And it worked, at least the first time. Prepare all the vegetables, by peeling them and dicing them. Boil the water and put the vegetables in. Let them boil for 15 minutes. Add the tomato juice, olive oil, salt and pepper. Continue to boil for another 5-10 minutes or until the beets and the carrots are soft. Let the soup cool for 30 minutes and then, with a hand blender pureed the entire soup. Serve it with fresh aromatic herbs. I chose parsley. Recipe inspired from "500 soupes" - Susannah Blake, page 34.